The Phoenix Center is a non-profit based out of Marble Falls, Texas providing therapeutic services to children and their families. One reason I have been so attracted to volunteering for this organization is because they have a comprehensive model found nowhere else! At the center they are able to provide individual and group counseling for children and adolescents age 3-18 years old. Camp Phoenix is offered throughout each summer serving children who have experienced trauma. Parenting groups are run utilizing Child Parent Relationship Therapy (CPRT). Trauma-informed trainings are offered to educators and administrators in the Marble Falls area. And finally, school-based programs increase therapeutic services Marble Falls ISD is able to offer. 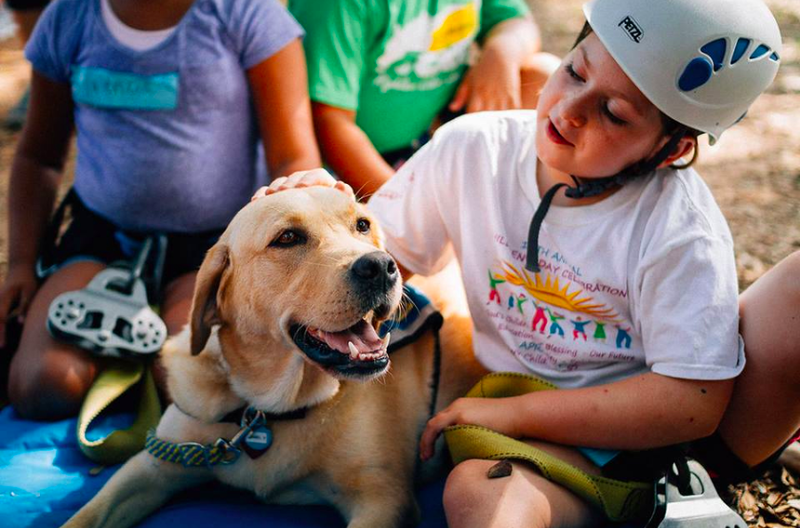 Animal-assisted counseling is even utilized through Mabel, their furry co-therapist, who can regularly be found in individual and group-counseling sessions with appearances at some camps across the summer. Best of all: no family is ever turned away due to an inability to pay. However, this article is about their innovative camp sessions so to hear more on that keep reading! In Summer 2017 and Summer 2018 I was blessed to volunteer at a camp session for young girls, as well as a few day camps for varying ages. My first camp experience was with 12 wonderful 3rd-5th grade girls. My most recent experience was with 11 warm-hearted 6th-8th grade girls. As many of you know, I am in the Texas State Professional Counseling program taking courses specifically aimed to shape me into a competent play therapist. This is why I have chosen to volunteer with younger groups at camp so I could practice and best utilize my skill set. So lets talk through a typical day at camp! I will not be including exact schedules or details on every activity as the Phoenix Center has worked SO hard creating their program, but I'd love to give some examples and talk about how these camps change lives in just three days. Horses! Unlike the summer camp I went to when I was younger, the horses are not ridden at Candlelight Ranch, but the campers are able to learn about them, interact with them, and even participate in group activities where they lead the horses through obstacles. Low Ropes Courses provide a chance to conquer fears and instill the value of teamwork. At this last camp session it was so interesting to watch the girls try to accomplish the tasks in groups and without communication among the masses they failed. However, as soon as they were able to ask for help and create a plan together they got it! Yoga - I think yoga is a tough time at camp because some kids are interested, some are tired and choose to rest on their mat, and some have a hard time revealing their positive affirmations to the group. I personally found this to be such a great brain-break and moment of calm within the heat wave. Expressive Art Activities- my favorite of which is creating a piece of artwork where we could all get messy and throw paint. Water games- did I mention it was 108 degrees?! Ziplines - one that even goes over a canyon!! Strength boards - I included a picture of mine below. As a camp counselor/co-facilitator/volunteer the first day of camp always brings up feelings of excitement for the campers to arrive, but also a lot of hope and expectations for the weekend. It is our job to be sure each camper can feel safe, supported, and recognized; which unfortunately are not always things they feel when at home. My most recent camp session included children of divorce, girls from families with a history of abuse, pre-teens in foster care, and many many more labels that I don't want to guide their future. These girls are bright, loving, brave, willing to open up, I could just go on and on. So the weekend commenced with the hope that I (and the other trained volunteers) could impact lives and facilitate bonds that allowed these girls to feel their power, recognize their self-worth, heal from their trauma, and enjoy their time in a safe environment. At camp they are asked to challenge themselves and push out of their comfort zones, but the saying the Phoenix Center staff always remind us of is "Challenge by Choice". An activity that always seems to promote this value are the ziplines and canyon crawl. The canyon crawl is a wire cable (that could hold an elephant!!) that is walked across while harnessed in over a canyon. If this isn't slightly terrifying then I don't know what is. At my first camp ever I had the chance to participate. I thought oh no biggie I've ziplined over a canyon in West Texas, I've hiked terrifying trails in South Africa, I've got this. Well...I got halfway across that wire where it started to get shaky and the wind picked up and the view below was beautiful, but also caused a pitter-patter of fear in my heart. The number of campers who feel scared at this activity is always high! So again, it is challenge by choice. At my most recent camp back in July EVERY SINGLE camper crossed that wire. To hear the sense of accomplishment and joy the girls felt for conquering the canyon crawl left me speechless. This was one of my favorite opportunities to process with the girls how they felt and what they are taking away from the experience. Many utilized breathing techniques on their way across which is such a wonderful coping skill for them to have in their "tool kit" in the future. How many times in life do we feel anxious or scared? A lot. So having a coping strategy that you know works for you from such a young age is magnificent. The other activity I really want to dive into is the strength boards which are completed as camp winds down and comes to an end. All the campers, counselors, and staff made a board and passed it around much like a yearbook. Except, instead of signatures our new friends wrote one or two words to describe a strength they saw in us over the weekend. I received words like caring, benevolent, helpful, strong, and gentle. However, before we ended the activity we were asked to add one word that we didn't see on our board, but that we believe is a strength of our own. My word: loyal. One reason I love this activity so much is because many of the campers may not be hearing these strengths at home and school. To see their faces light up when they read the qualities others noticed within them is magical. My first camp I wrote the word 'brave' on a girls board who had come out of her shell over the weekend, had made new friends, had chosen to challenge herself at every activity, and told her story of neglect during one of the processing activities. I so vividly remember her standing up when asked which words on the board surprised her and she said BRAVE! She said she had never considered herself a brave person and her smile lit up the pavilion. Oh how glad I am that I included that on her board, because it was true. To those of you reading this- I challenge you to share some positive qualities you notice in your friends, family, and/or kids with them today! Beyond that, I challenge you to think of a word to describe yourself. I chose loyal, what will you choose? To end this saga, I want to touch on the topic of trauma-informed therapies and why they are so important. A very interesting study was completed showing the prevalence of adverse childhood experiences and the impacts they can have. The study looked at the relationship of childhood abuse, neglect, and household dysfunction to many of the leading causes of death in adults. Childhood trauma isn't something you just get over as you grow up. In a TED talk, pediatrician Nadine Burke Harris explains that the repeated stress of abuse, neglect and parents struggling with mental health or substance abuse issues has real, tangible effects on the development of the brain. However, risk does NOT define destiny. Read more, watch the TED talk, or take the questionnaire yourself by clicking here and scrolling down. THANK YOU Phoenix Center for not only offering services for children and their families whose lives you change everyday, but also thank you for allowing me to be a part of that impact; even if only for a moment in time. If YOU would like to learn more about the Phoenix Center go check them out at www.phoenixtx.org.